On January 17, 2010 Jim’s life changed as he knew it when he made a trip to Kenmore Mercy Hospital Emergency Room with uncomfortable pains in his stomach. After many tests the ER Doctor came in the room and stated you have Colon Cancer and it is in your liver and lungs. After testing the diagnosis was confirmed that he had Colon Cancer-4th stage as it was metastasized from the colon to his liver and lungs. 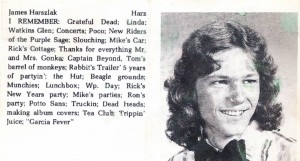 Jim Harszlak was a 1974 Graduate of Tonawanda High School. He grew up in Tonawanda with his parents Grace and William and siblings, Suzanne Harszlak Schrader, Bill, Donna Harszlak Salmon, Michael and Chris. In February 2010, he had a mediport put in and started his first chemotherapy treatment with Dr. Soh of Harbor Medical Clinic. After two treatments, the chemotherapy caused bleeding and he was admitted for colon surgery at Kenmore Mercy. A week after discharge he was readmitted to Millard Fillmore Hospital with a colon leak and infection. Four days later he had more surgery and was in ICU for four days and was discharged after 11 days in the hospital. During this stay the surgeon even before the surgery notified the family, that the disease in the liver was extensive and that Jim would not be around much longer. In November 2011 he was accepted to go to Cancer Treatment Centers of American in Zion, Illinois for evaluation. He was evaluated and they found the cancer metastasized to the lower back bone. They started his 3rd round of chemotherapy with a different cocktail and he traveled there every 3 weeks and took a daily chemotherapy pill. His last treatment there was in March 2012 and he was evaluated in April 2012. The chemotherapy was not working, but he needed radiation to the back. Jim was a warrior fighting his cancer every day of his life. He was expecting a miracle and had faith that God would heal his cancer. He lived life to the fullest, got married on May 1, 2010 to Susan Holler, and was baptized at Bethesda Church on June 2011 with his wife. He traveled to Dominican Republic, St. Croix and the Bahamas during this time. Attended many concerts, volunteered his time to advocate for breast cancer, colon cancer, suicide prevention, and worked the parking lot to fund Vacation Bible School. He lived life to the fullest and now he is cancer free and home with God. Jim did not want to celebrate his 56th birthday. He said, “I want to celebrate my new birth date, the day I am cancer free”. It did not happen on earth, he went to celebrate that day with the Lord on September 12, 2012.